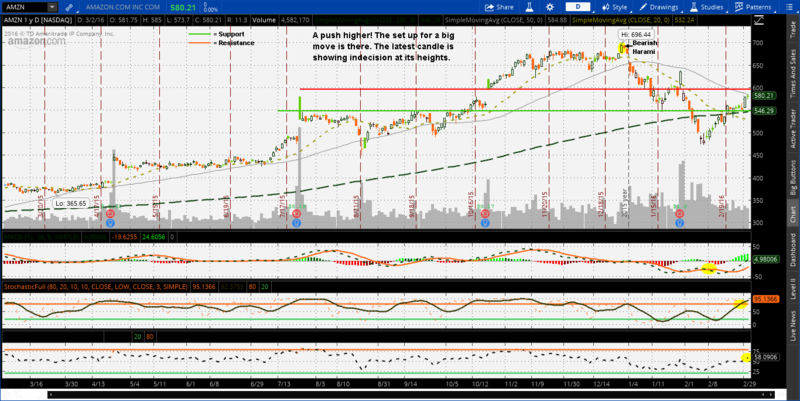 Update 5/14/16 – Amazon made a push higher from its recent earnings to make another 52 week high. It moved in its normal range and the chart shows that it has a strong chance of consolidating or pulling back. The RSI shows that once it reaches overbought, it pulls back. 700 holds the key for it to stay bullish. This is very dangerous waters to enter at the current height. Update 5/9/16 – Amazon had earnings come out to help elevate the stock back to its most recent sell point and this higher end of the range may continue to play out until 650 support breaks. 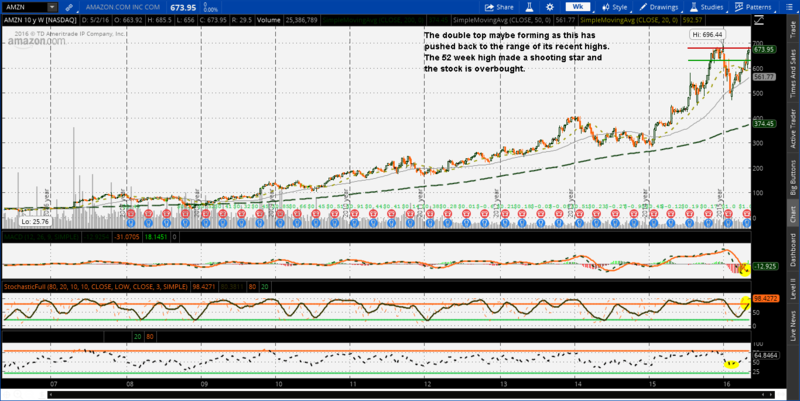 The weekly is showing this is overbought on both the RSI and stochastic. The RSI still has some room to run is what the past indicates and the MACD is also looking to cross bullish so this could float or make another ultimate push to 700 before its next move lower. A potential double top is in play. Being a bull at this height is extremely risky. Update 3/3/16 – Amazon pushed higher! I was wrong on the last update as the squeeze came into effect to boost the stock to 580. The chart is currently showing that the stock is indecisive at its 50 day moving average. Its hard for this to keep going but don’t count out big money to make it to 600 again. This is in a reversal zone and prime for it very soon. Update 3/1/16 – Amazon is lingering and showing that it is preparing for a decent move. Currently, that move looks to be in advantage to the bears as the indicators are looking to move lower. The trend may continue lower and another 540 test could happen quickly. Stairs up, elevator down. Dwayne Tucker is an individual investor who started trading in 2006. Like many other beginners, he lost a small fortune. From his experiences and diligent self-education, he created a simple method to earn a consistent return. Now he works to help other beginning investors avoid the same mistakes he made. He created the website with the help of Cambron, to simplify the the market and help anyone earn money.